If you want to change options that affect your entire Gamestar Mechanic game, click the Settings button under the name of your game, at the top of the sidebar. The button opens the Game Settings dialog box. Game Name: This is the name of the game, of course. Always change this name to personalize the default name, New Game. This name is the one that players see in Game Alley and on the player page. The name can be no longer than 25 characters. Game Intro Message: This message explains the game or introduces a storyline. This message, displayed at the beginning of the game, has a maximum size of 500 characters. Game Win Message: This message is displayed on the You Win screen, after the player beats the game. It must also be 500 characters or fewer. Goals and Rules: This is a special section of the Game Intro Message in which you can describe the elements of the game to players. This section is optional and doesn’t show in your game if you enter nothing. It can hold 150 characters. Tips and Tricks: You can use the five text boxes to add tips to help players beat the game. You can fill in none, some, or all of the text boxes, and they’re printed accordingly. Each tip holds 150 characters. At the bottom of the dialog box, click Save to update your game settings or click Cancel to undo your changes. If you have a lot to write about, you can do so through special sprites such as the text message block. 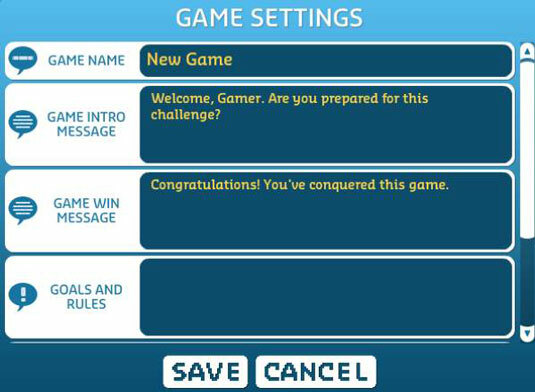 Just use the Game Settings to introduce and wrap up the game, and leave the rest to your levels.